Anna fell in love with the flute as a young child and began her formal education aged eight. She is committed to creating a fun, stimulating learning environment that supports her students to feel a sense of joy and pride in their learning and music making. Anna is not only an accomplished flute player, but also a trained early childhood teacher with a sound understanding of how best to support children’s learning and development. 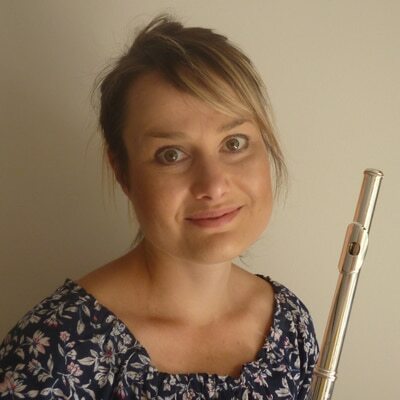 Anna holds a Master of Music with 1st Class Honours in performance flute from The University of Auckland (studying under Professor Uwe Grodd), a Master of Music Therapy from The New Zealand School of Music and a Graduate Diploma in Teaching from The University of Auckland. Anna is skilled at assessing and planning for her students’ learning and selecting teaching strategies that best suit their unique needs, as well as strengths and abilities. She enjoys teaching music that her students really want to play, as this ensures that their interest and motivation is sustained when things get technically a bit tough. Anna also teaches music theory and aural training in preparation for exams. Over the years, Anna’s students have enjoyed considerable success in both Trinity College London and ABRSM international music exams.